After the success of September, with all the competitions I hosted myself, I started to look into this competition malarkey to see what all the fuss was about! I felt like I'd just stepped into a new century, a era I didn't know about, and a world I'd only just discovered existed! Sure, I've entered a few competitions here and there in my lifetime, and have been ever so lucky to win the odd few, but never in my lifetime have I come across a competition to win chocolate, but not just any chocolate, Cadbury's chocolate! 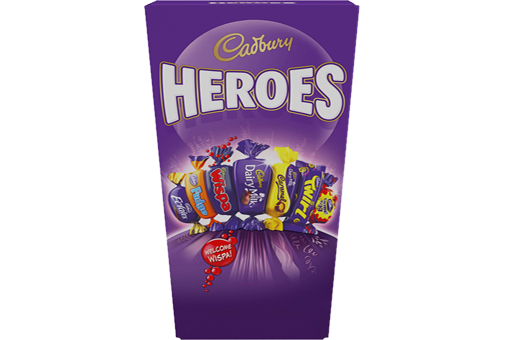 The wonderful people over at Euroffice are giving away 52 boxes of miniature Cadbury's Heroes! To make it clear, just to tease ourselves that little bit more, that's a box a week, for a whole year! Who's feeling as though they're in heaven right now!? I know I'm not alone! Who doesn't love chocolate!? All you've got to do, to be in with the chance of winning, is rally your office together, and all the office stationery you own between all of you, to make a famous landmark or a holiday inspired setting! I'm thinking of ideas already and I've only just discovered the competition! I'm thinking Egyptian pyramids using set squares, post it notes, biro pens and blu tac!